The mobile winch is the workhorse and key to the success of the plowing operation. Up to 380 tons of pulling forces are required to move the plow through the ground when installing cables or pipes to depths of up to 2.5 metres, in ground conditions ranging from sand to medium rock. 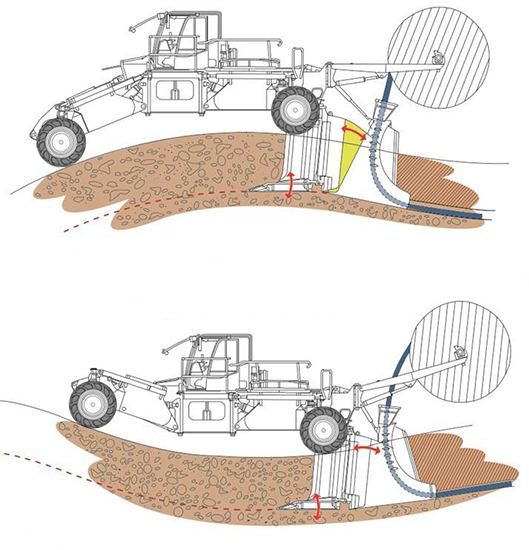 Separated from the SPIDERPLOW™, the winch crawler with anchor spade sits 110 metres ahead of the Plow and stabs its spade into the ground to provide a stable footing before it starts winching. Once the plow starts moving, it takes 3-15 minutes to install 100 metres of cables or pipes, depending on laying depth, diameter of pipe and ground conditions. An installation speed of up to 1500 metres per hour is achievable in normal ground conditions. The spider-like adjustable wheels adopt to undulating terrain and overcome slopes, ditches and other hurdles. The plow’s laying sword slices the ground like a hot knife through butter. Ripping, laying and partial backfilling is performed in one single operation. The ripper shoe is attached to the bottom of the laying sword. It clears and shapes the laying bed prior to the cables or pipes being laid. Stones and rocks are crushed and pushed aside through tremendous winch-/ripping forces of up to 380 metric tons. 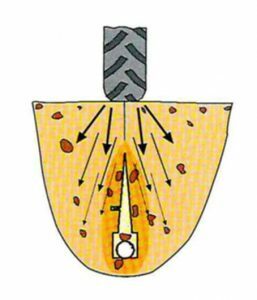 By dragging the ripper shoe over the bottom, it creates a smooth surface at the sole of the cavity so no stones or rocks can damage the cables/conduits or pipelines from below. This created storage shaft is then filled with sand when the rain washes the fine particles down and settles them around the conduits. The addition of sand is not required and the quality of the cables/ pipes is not compromised. The cable and pipe chute is dragged along the pre-formed cavity under great pressure to form a secure and smooth laying bed in which the cables and pipes are gently placed in. 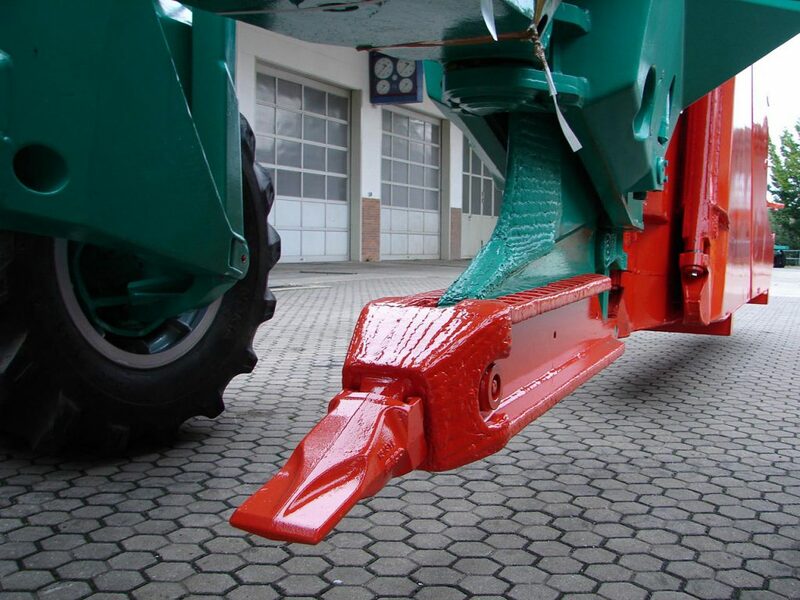 The SPIDERPLOW´S™ entire laying system automatically adjusts to individual insertion angles and takes challenging, uneven terrain in its stride. The need for sand-bedding and padding is entirely eliminated. After the laying process, fine particles trickle down the laying slot and settle naturally around the cable and pipe, creating protective sand-bedding. Cables and pipes are inserted without tensile stress and zero load. The possibility of damage to the cable and pipe is completely eliminated as downward pressure arising through compaction and heavy traffic are deflected sideways due to lateral slicing compaction created by the massive plowing forces. The quality of the laid cable/ pipe is superior over open trenching with sand bedding and padding. Open trenching is a technology that requires many complicated and expensive steps that slow the construction process down. It leaves cables and pipes vulnerable to damage from unselected backfill material through point-loading from direct downward pressure when compacting the trench. The need for sand-bedding and padding is entirely eliminated. After the laying process fine particles trickle down the laying slot and settle naturally around the cable and pipe, creating protective sand-bedding. Possibility of damage to the cable and pipe is completely eliminated as downward pressure arising through compaction and heavy traffic are deflected sideways due to lateral slicing compaction by the massive plowing forces. Therefore there is no point-loading through stones on the cable or pipe, so they can not get damaged. Open trenching is a technology that requires many complicated and expensive steps that slow the construction process down and leaves cables and pipes vulnerable to damage from unselected backfill material through point-loading from direct downward pressure when compacting the trench.